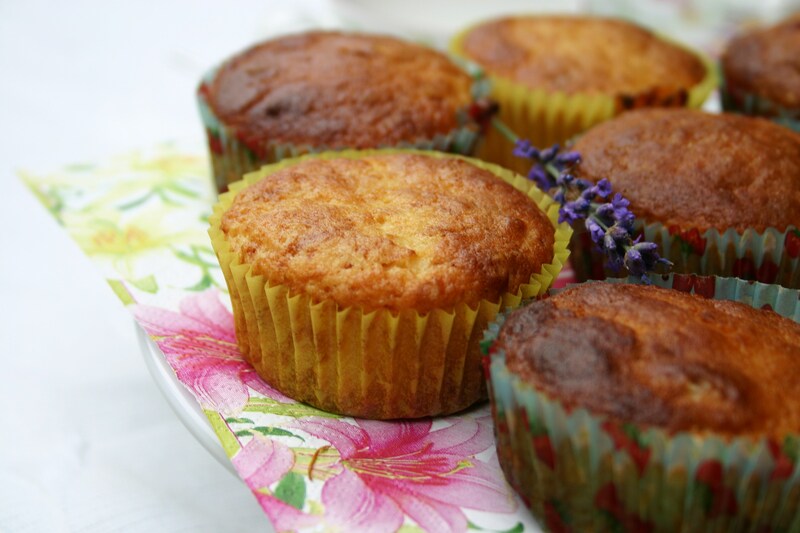 Eating outdoors in the evenings is not feasible at the moment due to the mosquitoes, but in the daytime a breezy area in the shade of our giant fir tree is the perfect spot for afternoon tea… and these muffins are so light and summery they are the ideal bite to serve on a hot afternoon. Preheat oven to 190°C (375°F). Prepare 12 to 16 muffin cases. (I like these a little smaller than regular muffins and got 14). Sift the dry ingredients together. In a separate bowl beat the egg lightly and stir in the buttermilk, lemon juice and oil. Mix into the dry ingredients just enough to incorporate the flour, but don’t overmix. Spoon half into the cases. Then add a dollop of lemon curd and/or a couple of small strawberry pieces. Spoon the rest of the batter over the tops and bake for 20-25 minutes. Have you been able to eat outdoors this summer? This entry was posted in Food, Garden, Recipes, Words and tagged Food, Garden, Life, Quotes, Recipes, Seasons, Summer, Vegetarian, Words. Bookmark the permalink. I love baked goods that incorporate citrus. This recipe looks lovely. Lemon and strawberry sounds lovely together! A great combination – lemon juice on fresh strawberries is also nice! No we have too many skeeters too. We have had so much rain and standing water on the lawn. Send some of your damp weather our way Donna. It hasn’t rained for almost 2 weeks now, and the garden is feeling it…. They look yummy, and I adore your lovely dishes! Thanks Laura. It was about time I started collecting a decent tea service, piece by piece! No mosquitoes here, but our lovely sunshine is hiding behind a gray, dreary fog bank. As soon as the sunshine returns we will return to patio dining! 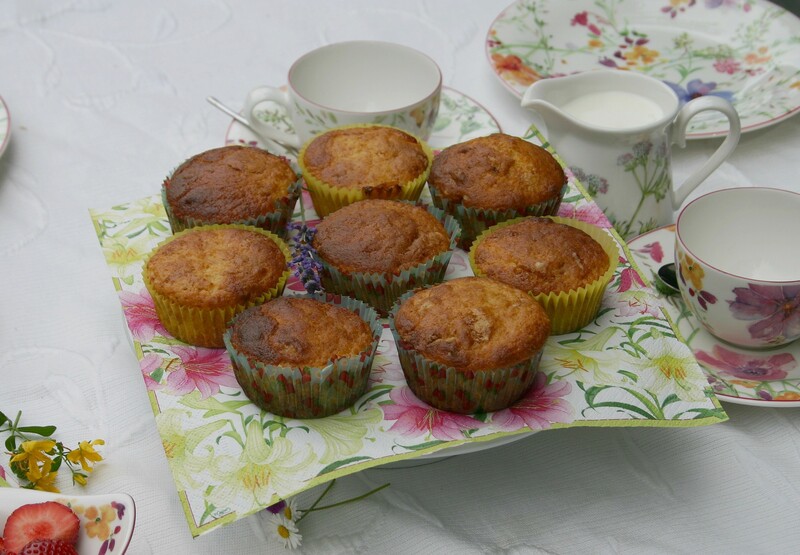 Scrumptious muffins for afternoon tea! If there are any leftovers send them my way for breakfast! Guess I’ll have my afternoon tea indoors today because it’s raining. What a lovely combination for muffins. They look awesome as always! I will save for next June 🙂 Got any goodies I can whip up with wild and strange mushrooms seems that is what we are all growing here 😦 Beautiful post Cathy. Thank you Eunice. Be careful with those mushrooms… are they edible?! Hope it dries up for you soon! Sounds delicious, I’m assuming I can use ordinary milk instead of buttermilk which isn’t available here. We live on the edge of woodland, which is nice and moist and shady – perfect for insects! The past few days have been ideal for sitting out during daytime though. 😀 Enjoy your weekend too Annette! LOL! They’ll grow up fast enough and soon you’ll be wishing they’d slow down! 😉 We’ve eaten lunch outside all week too. Have a sunny weekend Marie, and hope the insects soon disappear. Yum! These look superb – great combination of flavours! Lots of strawberries at the markets right now…so good. These are so seasonal, and sound delicious. 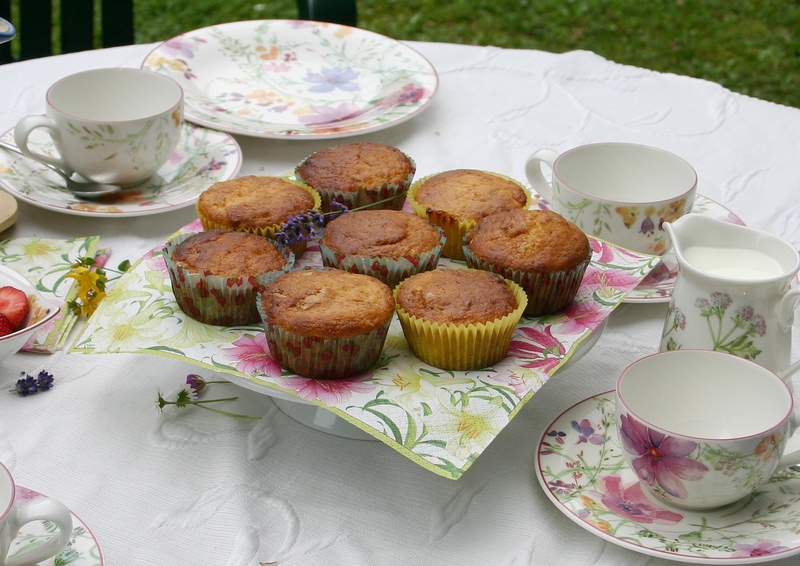 And the butterfly buns I made using your recipe went down very well on the tea stall at the village gala last weekend – thank you! So glad the butterfly cakes were a success. The buttermilk in these makes them very light and moist, so I shall be experimenting with other berries in them too. Those muffins are making me hungry. Don’t mind if I do …. Hi Cathy, I always like your porcelain and decoration. Right for summer feelngs. We use our outside place for sunday morning breakfast and all days in the afternoon for coffee and cake. I am on a good way to reduce my coffee consum. Thanks Uta – hope you have a sunny Sunday for breakfast outdoors again! 😉 So you are a coffee lover too? Hey Cathy! How absolutely yummy! I love the flavor combination so perfect for the season. I enjoy a cup of tea quite often even on the hottest days….a breeze is nice too! Thank you – yes, enjoying some lovely summer days. Not too hot, just warm and breezy with blue skies… 😀 Hope your summer is going well too.